All catering is provided by the Springwood Park pub / restaurant which is part of the same complex. Finding it: Located just off the Silk Road, Macclesfield’s bypass, at the Bollington roundabout (not the Flash Lane roundabout) take the turning towards Tytherington. In 100 metres take the first exit at the roundabout then take the first entry to the left, and immediately left again. 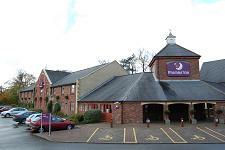 The Springwood complex is in front of you with the Premier Inn entrance straight ahead.